Hey there!! Here with a card for this week's Shabby Tea Room challenge. 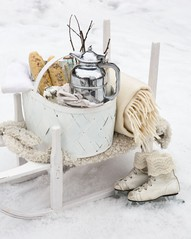 My IRL friend, Cindy, is the hostess with the mostess over at the Tea Room and she has provided us with a gorgeous inspiration photo and the challenge to use white or cream, silver and glitter. So for me that means doing two things I don't do a lot of: making something covered in glitter and heat embossing. I don't do either with any frequency because of my limited work space and the fact that it also happens to be my kitchen counter! Anywhoo... for my card I created a double snowflake with some snowflake chipboard pieces I had kicking around. I covered the snowflake with some Diamond Glaze and then poured on the glitter (Art Glitter Wisteria for one (a light, light blue) and Art Glitter Ultra Fine Blue Rain). A blinged up button from BasicGrey (say that 3x fast!) was adhered to the center of one snowflake using more Diamond Glaze and then the two snowflakes were adhered together using foam dimensionals. The border from the WMS set Victorian Frippery was embossed in silver on the bottom of these neat postcard type piece from Stampin Up! and then I trimmed around to create the scalloped edge. I inked the edges of another cardstock piece with a VersaMark pen, applied silver embossing powder and heat set. The sentiment from Hero Arts was embossed in silver on the bottom of the card base. Everything was layered up as you see it, some cream seam binding added and then the whole thing adhered to the card base. The layout for the card once, again, is courtesy of another fabulous sketch from Sketchbook Saturday. Hey there... back with another card for the current CASE Study challenge and ColourQ. 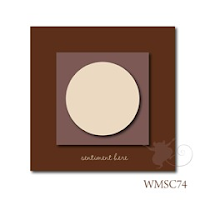 I just love this week's ColourQ combo of Cherry Cobbler, Pumpkin Pie, Delightful Daffodil, Early Espresso and white. Cherry Cobbler is my absolute favorite red. I love how deep and rich it is, especially against white. When I saw November CASE Study muse, Kryssi's card I just had to play along. I love the super clean and stunning, as my friend Sue would say, design of the card. I thought I had a large solid flower stamp that I could use, but unfortunately, I didn't. So instead I got a little dotty with my card, combining PTI's Dot Spot with Polka Dot Basics II. I stamped the largest circle from Dot Spot in Pumpkin Pie and then used So Saffron to stamp the border using the smallest polka dot border in the set. The sentiment from Signature Greetins was stamped using Early Espresso. I decided to add the yellow button to the center for just a bit more interest. Hey there!! Another Saturday is here and a new Less is More challenge. This week Chrissie and Mandi are challenging us to use bling on our projects. 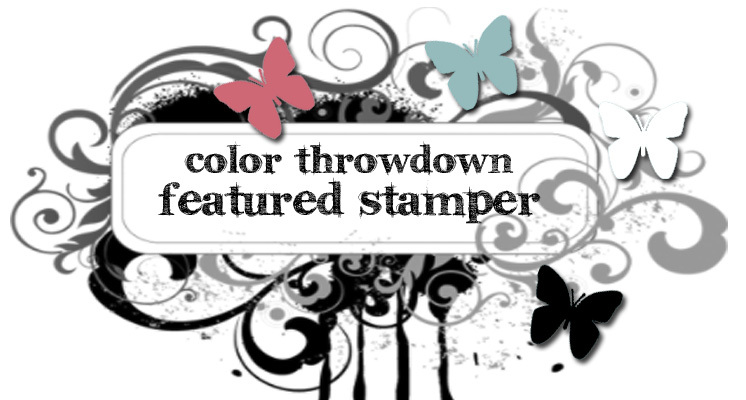 And when I saw the challenge I had the perfect stamp in mind, too! 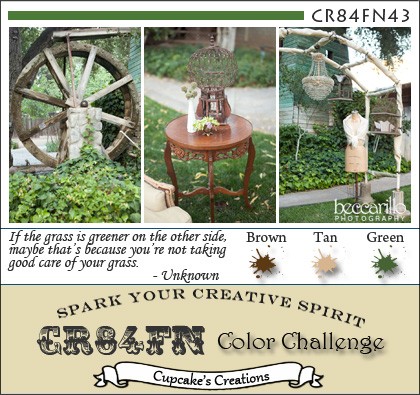 I'm also putting this card in to the current CR84FN challenge to use green, tan and brown. The layout comes from a Clean & Simple sketch from several weeks ago. I had been struggling to find an idea for the CR84FN challenge, but this week's LIM challenge turned out to be the perfect match for me!! The stamps I used for my card are from Penny Black. A wood-mounted stamp called Reverie and the clear set, Let It Snow. I stamped the image using Memento Rich Cocoa on Rustic Cream cardstock and then diecut it using a Spellbinders small circle die. 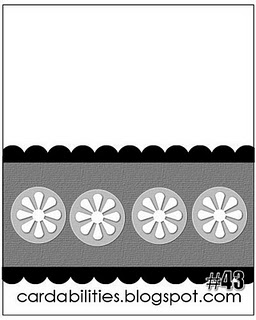 The patterned paper is from Stampin Up! (the Frostwood Lodge pack) and was also diecuting using a Spellbinders circle die. Some additional Rustic Cream was diecut using a Spellbinders Grommet Tag die and then I stamped the sentiment "twinkle" on it using Nick Bantock's Sapmoss Green ink and then I spiffed up the tag with the ribbon, twine and buttons. The bling (green, brown and clear) was applied to the tree randomly. I absolutely love how the card turned out!! I will also be linking this up with the Buttons Galore & More linky party. I realize it is a bit non-traditional for a Christmas card, but I will, in fact, be using it as such. Hey there... happy Friday! 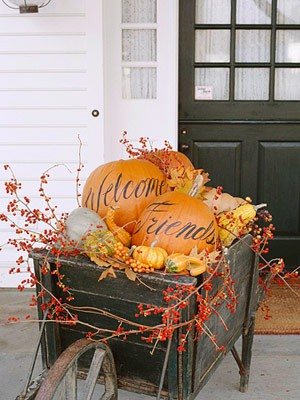 Hope everyone in the US had a great Thanksgiving day! 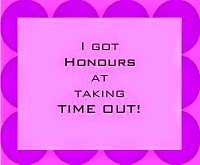 I know my family did!! Now its time to start getting ready for Christmas...YAY!! I love Christmas! But today I have probably one final fall-type card. 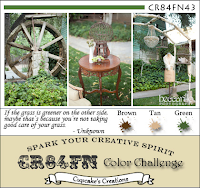 This one is for the current Shabby Tea Room challenge to use the colors provided in a gorgeous inspiration photo. The layout for the card comes from Sketchbook Saturday. If you haven't checked out Chupa's sketches... you really should! She always has super fun sketches! 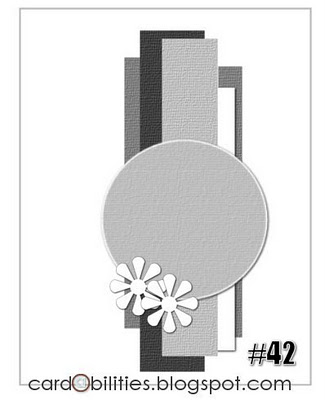 The only stamping on the card is the sentiment which is from a Hero Arts/Basic Grey set (Luscious Frame). Lots of diecutting and punching, though. I tried to pull alot of colors from the inspiration photo and combine them in a pleasing manner. (And hopefully I succeeded!) The patterned papers are from PTI (Autumn Abundance) and DCWV (Christmas stack). The flower was made using the Spellbinders Carnation Creations dies and I'm going to be honest... I don't like this set of dies as well as I like the Spellbinders Rose Creations dies. But I think the flower turned out okay. I used the red burlap strip to help break things up a bit. Hey there!! Happy Wednesday! Have another Christmas card using non-traditional colors. This card is for this week's ODBD Shining the Light challenge to have bells or baubles hanging from your card and the City Crafter's challenge to make pink the focus of a Christmas card. For my card I used the ODBD Poinsettia background stamp and a sentiment from the ODBD Holly Tag set. The papers are from the SU! paper pack called Beau Chateau. The ink is SU! Pink Pirouette and Marina Mist. I used some of that absolutely yummy May Arts crinkle ribbon for the bow. It took me a while to figure out how I was going to attach the bells, but finally got it right this morning. As I was finishing up the card it struck me as funny that I was putting bells on a card with a sentiment saying "Silent Night, Holy Night"! I did some distressing (with ink and a distressing tool) to soften things up a bit. The layout is from Deconstructed Sketch (DS28). 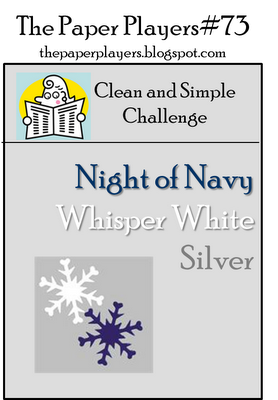 Anywhoo... my card is for a couple of challenges: Paper Players to make a CAS card using white, dark blue and silver and Waltzingmouse (a sketch). I must admit that when I saw the Paper Players challenge to use silver I was on the fence a bit as to whether I would play along or not. I don't generally use metallics in my paper crafting because I just don't like how my projects turn out when I have used them. But because I like to participate in the Paper Players challenges as often as I can I decided to give it a go. I used the WMS set Dainty Doilies (large), stamping the largest doily using Night of Navy ink and then diecutting it with the largest die in the Spellbinders Large Scallope Circle dies set. One of the small doilies was stamped in the center using VersaMark ink, silver embossing powder applied and heat set. The sentiment from Dainty Doilies was also embossed using silver embossing powder. It was then die cut using a Spellbinders Grommet Tag die. Some Night of Navy grograin ribbon, white & blue bakers twine and silver glitter brads were used to create my favorite little ribbon treatment. 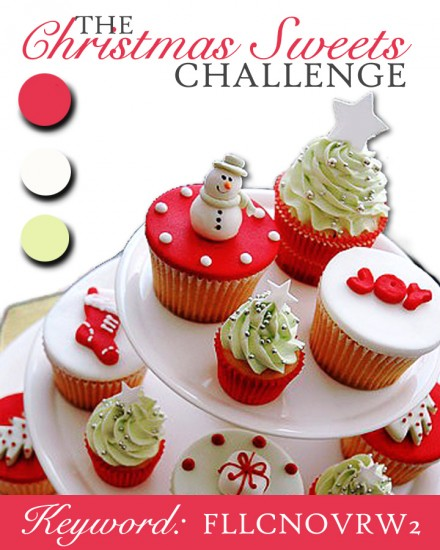 Hey there.... its Saturday and time for a new challenge over at Less is More! This week the challenge is to use a silhouette image on our clean and simple project. I'm not big on silhouettes, but I do own a few from Hero Arts and used one called Teatime Silhouette for today's card. Because the stamp has a frame around the image and I wanted to die cut it with a Spellbinders plain circle die I was careful to ink only the interior image and then wipe off any ink that might have gotten onto the frame portion. Lucky me, it only took one try to get the image stamped!! I used Tuxedo Black ink and where the image was kinda splodgy I filled it in with Tuxedo Black marker. I die cut some purple cardstock using a Spellbinders scalloped circle time and some black cardstock using a Spellbinders Fancy Tags 3 die. Everything was layered up using foam dimensionals. 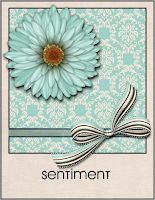 The sentiment is from the Taylored Expressions set Creativi-Tea and was stamped using Memento Grape Jelly ink. Hey there!! Happy Friday to everyone. Got a card for a couple of challenges: Cardabilities and Flutterby Wednesday. I have heard about Flutterby Wednesday challenges before, but had never checked out their challenge until just the other day and since this week is "anything goes" I decided to give them a try. 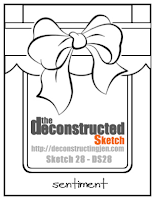 The layout of the card is courtesy of Cardabilities.... another fantastic sketch!!! 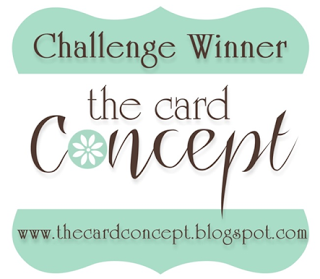 A shout out to Cardabilities is in order... they picked the card I entered in the last sketch challenge as one of their top 5!!! Thanks so much ladies!!! I did make one small change to the sketch... I only used three butterflies instead of four. This mainly came about because the middle butterfly is quite large. The papers and the butterflies are from the Pink Paislee Butterfly Garden collection. I stamped a large flourish image from Hero Arts in Spun Suger distress ink on the patterned paper and then the sentiment (also Hero Arts) in VersaFine Vintage Sepia. The crocheted lace is from My Mind's Eye Lost & Found Christmas. 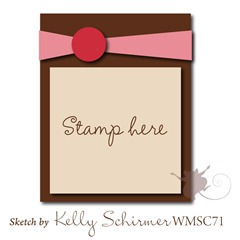 Anywhoo... have a card today for the current CR84FN color challenge to use pink, black and a neutral. 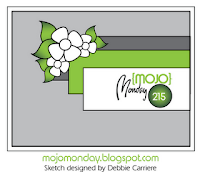 The layout is courtesy of Mojo Monday. It took me awhile last night to hit on the right combo of cardstock and papers. I started out with some patterned paper from Pink Paislee, but it didn't have enough pink and looked completely wrong with everything else. So I got out my trusty 6x6 pad of Blush papers from My Mind's Eye and found just the right pink gingham paper. The next problem was trying to work the black into my card. At first I tried to use a solid piece of black cardstock in the sketch, but it looked way too harsh and out of place. After trying a few other ideas I decided to stamp some cream cardstock with the Penny Black Delicate Pattern background stamp, add some Old Paper Distress Ink and finally acheived the right look. The poinsettia image is the Penny Black stamp Christmas Star... my absolute favorite Penny Black stamp. The image was stamped using Victorian Velvet distress ink and then colored with Spun Sugar distress ink. The sentiment (also from Penny Black) was stamped on cream cardstock, die cut using a Spellbinders grommet tag die and then Old Paper distress ink applied. Hey there!! Hope your week is going well... can't believe the week is already half over! Yikes... time sure flies!! Have a card for a couple of challenges. 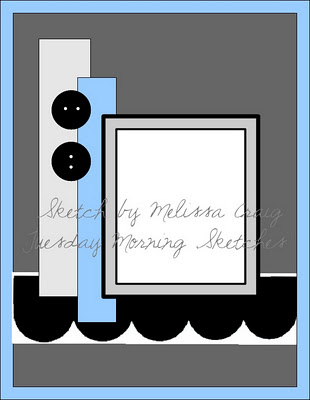 One is a "new to me" sketch challenge called Tuesday Morning Sketches. The other challenge is one of my favorites: Flourishes Timeless Tuesday. Sadly I haven't done a Timeless Tuesday challenge in a few weeks. I tried to make a card for last week's challenge to use the "double embossing" technique, but things didn't turn out so well for me and I gave up. So, I was determined to make something for this week's challenge. The time is from the Flourishes set Sweet Violets and the sentiment from the Hero Arts set Find Joy. I had to tweek the sketch just a bit to make it work, but the basic layout is still there. 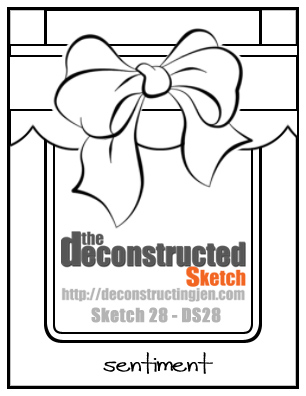 The Tuesday Morning Sketches challenge comes with a "twist" this week in that they want you to make a card that "gives thanks". With Thanksgiving just around the corner I could pulled out another fall/thanksgiving type image, but I wanted to take a break from that and for that reason I chose to use the Sweet Violets set. I colored the image with the following Copic markers: V000, V04, V06, V09, Y21, YG93, YG95 & YG97. All papers and cardstock are PTI. 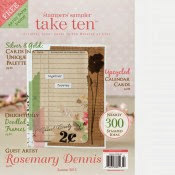 The image was diecut with a Spellbinders large plain rectangle die. The challenge at Timeless Tuesday is to add a flag and so I created the little pennant type flag for the sentiment. Hey there!! It's Saturday and time for another Less is More challenge. This week our LIM enteries need to be one layer and have leaves on them. Here in the US Thanksgiving Day is right around the corner and so I made a "thank you" card which fits right in there with the current Lawnscaping challenge. Sadly, I don't have any Lawn Fawn stamps, but in order to play along with the Lawnscaping challenge you don't necessarily need to have Lawn Fawn stamps. 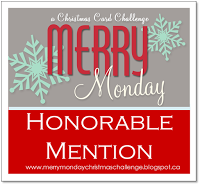 Oh and thanks to Chrissie and Mandi for picking my Wishing You card to be "ShowCASed"!! Hey there!! 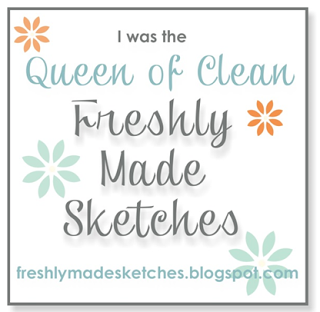 Have a couple of projects to share and both are for Flourishes release week challenges. Up first is a tag I made for their "Tag Your It" challenge. To be honest, I cannot remember the last time I made a tag. Now, my sweet friend, Sue, she is the Queen of Tags. 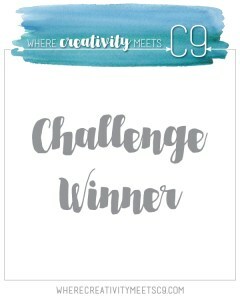 She has been taking part in this tag challenge over at the Funkie Junkie and let me tell you she has been making some absolutely amazing tags! My tag is quite modest in comparison to her masterpieces, but I'm very happy with it all the same. To make my tag I fired up my very neglected Cricut and cut two sizes of tags from the Tags, Bags, Boxes & More cartridge. One tag was cut from SU! Cherry Cobbler cardstock and the other from My Mind's Eye Lost & Found Christmas. A bit of the bottom was trimmed off the Cherry Cobbler and the two were layered together. Using my Spellbinders Layered Poinsetta dies I created a small poinsettia. The pieces were adhered using foam dimensionals to give the flower more dimension. I stamped one of the wreath images from the Flourishes set Wreaths of All Seasons on the tag and then layered some lace ribbon, a pearl flourish and the flower on top. A small tag was die cut, stamped with the sentiment "For You", some twine was added and the piece adhered to the tag. My card is for the second Flourishes release week challenge "Christmas Sweets", to use red, white and light green. Back at the end of September there was a big contest on the SRM Stickers blog. The grand prize was $400.00 of merchandise from Marvy/Uchida. Well... I was the winner of that grand prize!! And what did I pick?? Why the entire line of Marvy's new permament markers (Marvy's version of the Copic marker). Yesterday my prize arrived on my doorstep! A box full of 144 markers!! So... 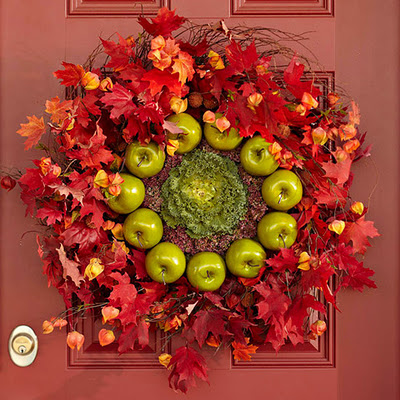 I used a few to color up another one of the wreaths from "Wreaths of All Seasons". (I can tell you from my limited use of the markers they work in much the same way as Copics. I'm excited to do more coloring with them.) 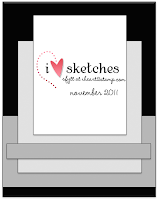 The layout for the card comes from this week's sketch over at Splitcoaststampers. I kept everything very clean and simple. Hey there!! It is that time of year... Thanksgiving time. The time we give thanks (hopefully) for all the things we have been blessed with. And that is the theme for this week's Shabby Tea Room challenge to use the colors of yellow, blue, brown and neutrals with a theme of "thank you" or "giving thanks". So... last night I made this little number. 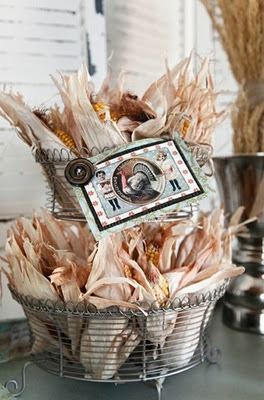 A very non-traditional "thanksgiving" card, for sure, but I really love it! I took a few pictures of it last night, but since it was dark by the time I got done, the pictures didn't turn out so great. Took a few more this morning that came out better. I'm also putting this into this week's ODBD Shining the Light challenge which is a sketch challenge. For my card I used the super yummy My Mind's Eye Lost & Found 2 Sunshine collection (papers, brads & pearl flourish). The floral image is from the ODBD set "Don't Worry". I stamped the image on white cardstock using Tuxedo Black ink and colored it with the following Copics: BG000, BG01, YG93 & Y11. The image was then trimmed out. The papers and cardstock were diecuting using my Spellbinders plain and scalloped square and rectangle dies. I leaned heavier on the yellow and blue for my card, but did bring in a bit of light brown with the addition of the rose from Prima. The sentiment is from the Taylored Expressions set "Celebrate Life"
Hey there! Wow... its Monday, again! Spent the entire afternoon on Sunday (yep... the entire afternoon) making a card for several challenges. I didn't think it would take me all afternoon as I was working with a sketch (which generally speeds things up for me) and a "card recipe", but when you mix in the fact that I was also fixing dinner at the same time a 30 minute project can turn into a 3+ hours project. Anywhoo... the card is for the current Paper Players challenge (a recipe: 3 patterned papers, 2 ribbons, one punch & some glitter). 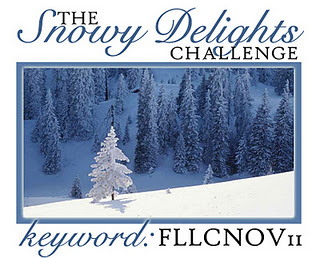 I also made this for the Flourishes "Snowy Delight" challenge. The layout is courtesy of this month's Something For You to Try sketch. 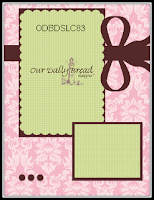 The patterned papers are Frostwood Lodge from Stampin Up! The stamps are from the Flourishes sets Holiday Sparkle and Country Charm Labels. To be honest I know that one of the things that slowed me down in the completion of the card was the label I created using some ribbon, buttons and twine. From start to finish it probably took me a good half hour just to make the label as you see it on the card. You might be wondering where the punched item is on the card and that would be the little flower in the center of the snowflake ornament. I stamped the flower image from the SU! set Punch Potpourrie and then punched out the flower using my Boho Blossoms punch. Glitter was added to the trimmed out pine bough and ornament. Despite the amount of time it took to make the card I am totally and completely pleased with the outcome! Hey there!! 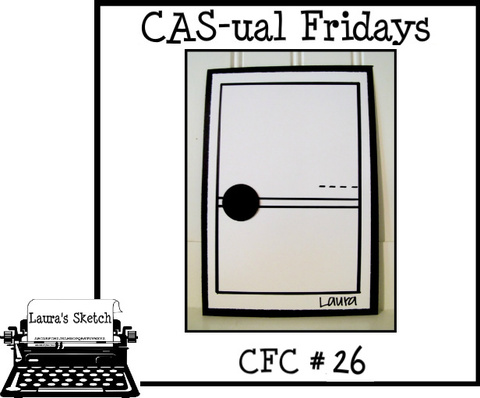 Here with a card for this week's Less is More challenge, as well as this week's CAS-ual Fridays challenge. This week at LIM the challenge is a color one and in honor of Guy Fawkes Day Chrissie (who is holding down the LIM fort by herself this as Mandi is away) has asked us to use the colors of red and orange on our cards (two of the colors in fireworks). The challenge at CAS-ual Fridays is to go "Over the Edge". 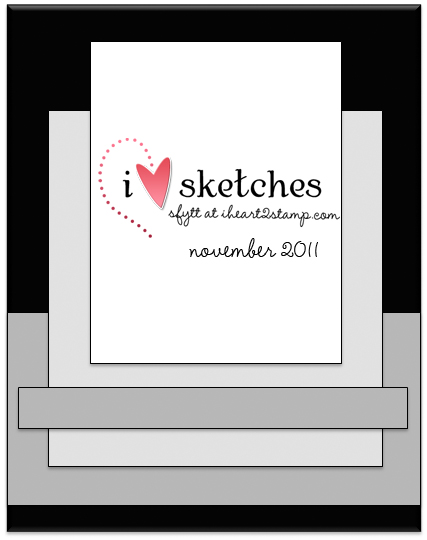 My card base is 5.5" by 4" and the stamped piece is 2" x 4.25". By trimming that quarter inch off the width of the card base, but leaving the stamped piece 4.25" you still end up with a card that will still fit inside a standard A2 envelope even though part of the piece is "over the edge". The stamps are from Penny Black. I did have to use one other color since my flower has a stem, but hopefully that is okay with Chrissie! The image was colored with Copic markers, trimmed out and adhered using foam dimensionals. A few orange pearls were added to bring in more orange. Hey there!! Here with a card for the Shabby Tea Room. I used the current Mojo Monday sketch so I will be linking the card up with that, as well. Once, again, we were provided with a beautiful inspirational photo at the Tea Room and I chose to go with the fall colors to be found in that photo. 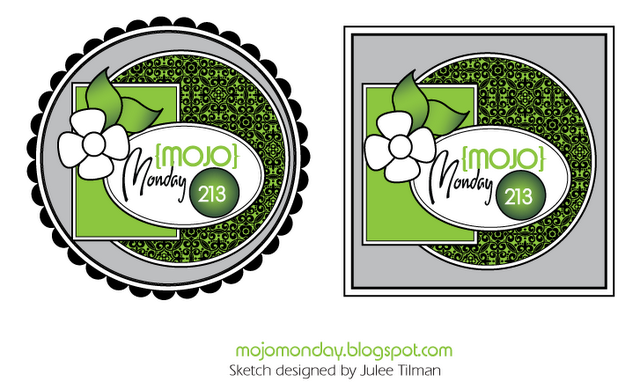 The Mojo sketch was the perfect opportunity to use my Cheery Lynn Designs French Pastry Doily die (say that three times fast!). The great thing about making your own doily is that you can use whatever type of paper/cardstock you want. Today I decided to use some plaid paper from PaperTrey Ink to make my doily and I love how it turned out! The little flower was created by stamping a small Heartfelt Creations Aztec Gold Sunflower image twice on Rustic Cream cardstock using Gathered Twigs distress ink and then applying Scattered Straw and Wild Honey distress inks. The little flowers were then trimmed out, cuts made between each petal, the petals shaped and then the flowers layered together. Diamond Glaze was applied to the center of the flower and then I applied this neat product called Elements to the center. Elements is kinda like glitter, but bit more chunky. The red leaves were die cut using a Sizzix die. The sentiment is from the Flourishes Gerbera Daisies set and was stamped Rustic Cream cardstock and then diecut using a Spellbinders Label 10 die. Hey there!! Another card I'm getting done at the last minute... that seems to be my MO these days!! This card is for the current Waltzingmouse sketch challenge (which closes like really soon!!) and the current Just Add Ink challenge to add a tag or bookmark. My tag is tiny, but it's still a tag! Anywhoo... the reason for my title is that when I finished the card I thought "wow... this looks like a sparkly yummy Christmas cookie! I guess that has to do with the fact that I went with a very pastel color combo: pink, light green, light blue and cream. For this card I used my recently re-discovered Cheerly Lynn Designs French Pastry Doily die. (You do ever do this: buy something put it away and then forget you have it until you are rooting through your stash and find it?? That happens to me way too much!!) The trees were stamped using SU! 's Pear Pizzazz (probably my favorite light green ink) and then trimmed out. I used my Quickie Glue pen to add glue to the trees and then applied pale, pale blue glitter to the trees. Each was then topped with a light blue gem. All three were adhered to the doily that was diecut from pale pink cardstock at various heights. The whole piece was then finished off with some absolutely yummy May Arts crinkle ribbon in pale blue (I LOVE that ribbon!!!) and a tiny tag pinned to the bow using a tiny pink pin. Hey there!! Here with a card for two challenges: JustRite Friday Challenge (use your scraps) and a new to me sketch challenge called Cardabilities. When I saw the sketch for Cardabilities I wasn't sure I would give it a try. But then I remembered the JustRite challenge, that ends in a few short hours (yikes) and thought I would give it a try. I kept everything really clean and simple for this card. I used up scraps from two different My Mind's Eye Lost & Found 2 paper lines: Sunshine & Rosy. Boy... I sure do love the Lost & Found 2 collections. I have used up alot of the pads that I have so I'm going to need to get more! The JustRite stamps used are from the My Garden and Vintage Oval Labels sets. I stamped the image in Tuxedo Black and then colored it with Copic markers. The image was then die cut with a Spellbinder small plain die and the paper with a scalloped circle die. The little flower was made using more scraps and the Spellbinders Rose Creations dies. 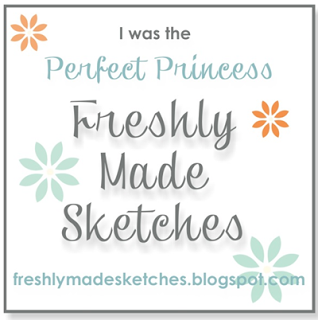 The sentiment was stamped in yellow ink and punched out using a Stampin Up! punch. Anyway... I have two cards that I'm sharing today. 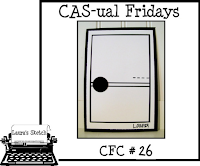 Both cards use the same layout from CAS-ual Fridays, but each uses a slightly different color combo. 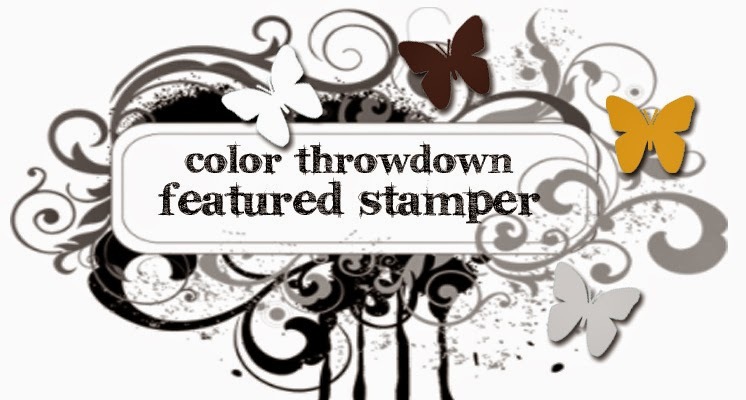 The first card will also be entered into the following challenges: The Paper Players - Anything Goes Fall and Stampin Sisters in Christ - use fall colors (crimson, orange & gold). The stamps are from Heartfelt Creations (Open Falling Leaves) and PTI (Autumn Elegance). I stamped the leaf using the new Distress Ink Bundled Twigs and then applied Wild Honey and Fired Brick distress inks. The leaf was trimmed out and some Art Glitter in Inca Gold was added. 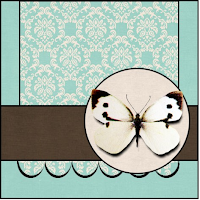 The ribbon is Stampin Up! Cherry Cobbler seam binding. The sentiment was stamped using Golden Gitz and Cherry Cobbler inks. Some small brads from BasicGrey were added at the bottom. The second card is for this week's color challenge at Splitcoaststampers (Alway Artichoke, More Mustard & Bravo Burgundy) was made in the same matter I just used Scattered Straw and Aged Mahogany distress inks on the leaf. 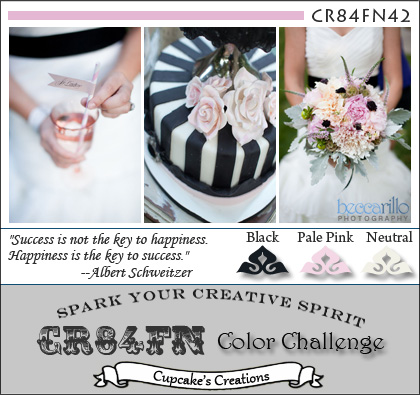 The sentiment was stamped in a different spot using Stampin Up! Bravo Burgundy and then a row of gems that I colored using a Copic marker (Y17) was added. The ribbon is Stampin Up! Always Artichoke seam binding.